It is a sunny day that the sun beats down unsparingly, as if it was a sign of summer. I visited Mr. and Mrs. Komatsu to eat phantom chicken that is called “Tosa Jiro”. 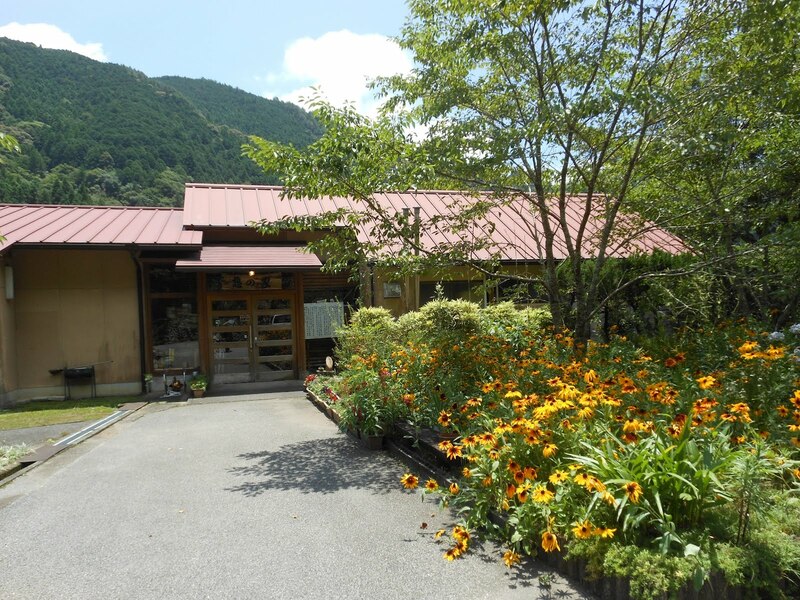 The bus moved through a steep, narrow mountain road for 40 minutes from Aki station, to the little village of Hatayama where there was a guest house “Hatayama onsen ikoi no ie” (畑山温泉　憩の家)” run by Mr. and Mrs. Komatsu of Aki city, Kochi, Japan. 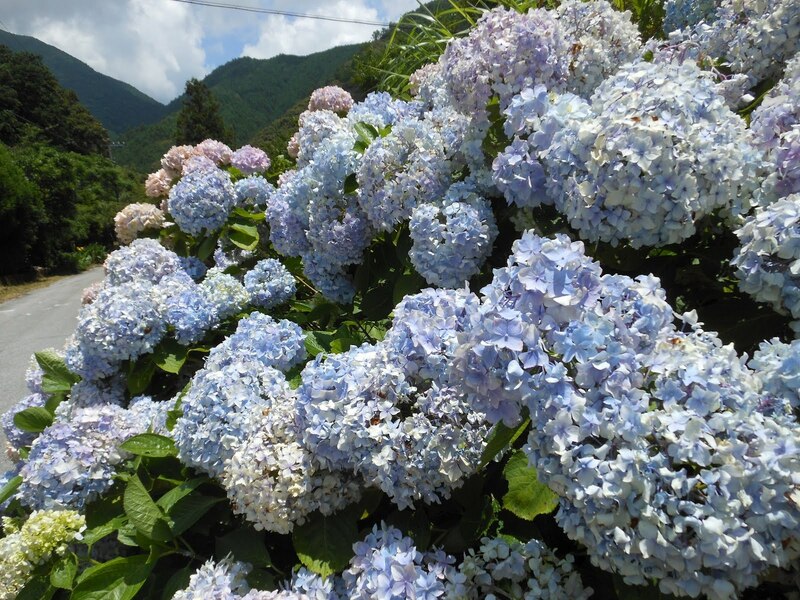 The guest house is surrounded by greenery and ajisai (Japanese hydrangea) blossoms in full glory and this good atmosphere made my heart leap with anticipation. The guest house also serves as a restaurant and there is also hot spring. That day, I had a rich chicken lunch in the guest house and learned so much about the Tosa Jiro chicken. I was served chicken sashimi that included parts of organs, tataki that is breast meat lightly grilled on the outside, a bowl of rice topped with chicken and eggs cooked together. 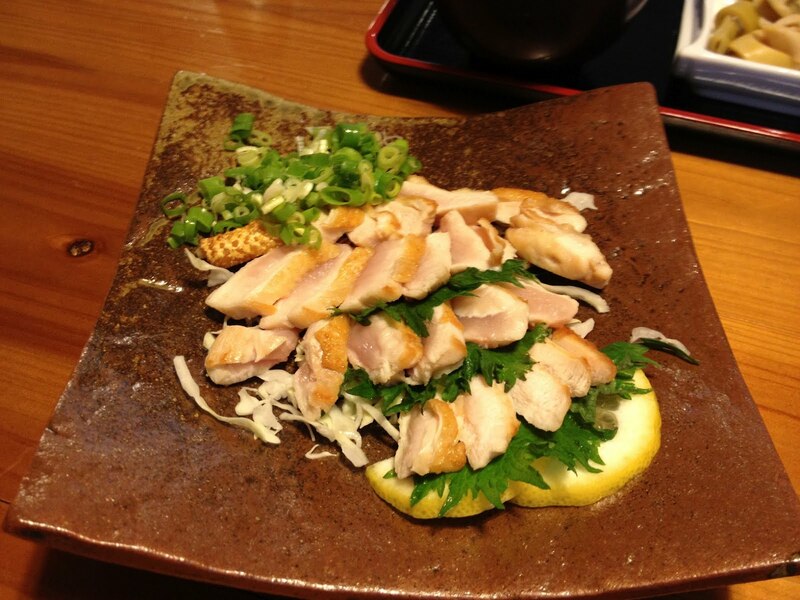 The dishes were so delicious because Tosa Jiro chicken has a strong clear and juicy chicken taste. And I had never eaten chicken’s sashimi before. I ate chicken’s heart, white meat, liver, gizzard, cookstomb, and milt. Each part had a lightly sweet, amazing taste. Tosa Jiro is a kind of chicken which is a first-filial-generation hybrid by crossing a male “Tosa Jidori” originally comes from Japan and a female “Rhode Island Red” originally comes from Japan. “‘Tosa Jidori’ is a Kochi prefectural natural monument,” explained Ms. Komatsu, “so, it is forbidden to eat ‘Tosa Jidori’.” But its offspring, ‘Tosa Jiro’, is quite delicious. 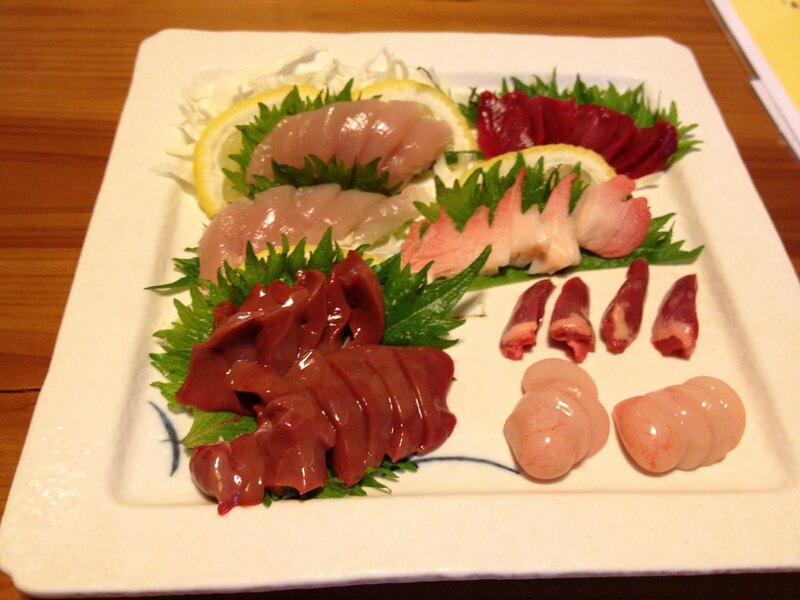 Ordinary, chicken meat cannot be eaten raw, but Tosa Jiro is because of the special methods they use to raise them. But that’s not what Komatsu-san does. “Tosa Jiro are raised by a completely different method,” she explains. “They are raised for 150 days without rushing in an environment as close to nature as possible, and shipped as a healthy, adult Chicken.” They breed their chickens in large place on the ground and feed them mainly non-modified corn,and fish meal, rice, organically produced vegetables and so on. They also eat grit for their gizzards. “This is what makes Tosa Jiro tastes so delicious,” Seiichi said. A chicken’s gizzard is the thick-walled part of a bird’s stomach used for griding food, typically with grit. But it is still working without food, and grit are fined out by rubbing against each other. Fine grit is pulverized and absorbed as minerals in the blood and circulate around the body. It causes a loss of body odor in the chicken. Chickens were originally prey in in the wild and developed this means to protect themselves from predators. In the modern bird, the meat loses the chicken’s peculiar odor and becomes delicious as a result. Like many rural villages in Kochi, Hatayama has been in long, slow decline. In 1954, it merged with Aki city and as a result, the population began decreasing. Many local people left there to look for work, but Komatsu is one of the few stubborn holdouts. He determined that if there were few jobs, he’d better just make one for himself. “I knew if I built a business around Tosa Jiro chicken, it’s gonna be the only one like it,” said Seiichi Komatsu. He and his wife are farmers, the only people who are raising Tosa Jiro for meat in Japan (other farmers raise it for its eggs). Komatsu was once a carpenter, but he quit his job and started the new Tosa Jiro industry in 1988. There were many problems about breeding Tosa Jiro, and he has gotten through then. There are some problems about Tosa Jiro now. But those problems will make Tosa Jiro special. 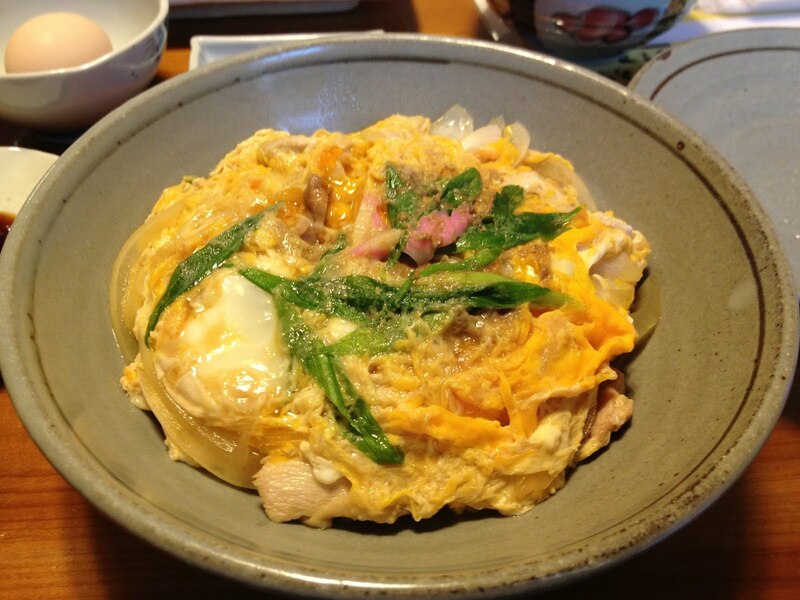 “If everybody can make it easily, it won’t true a local speciality, ” said Seiichi Komatsu. Now, 5000~7000 people, including celebrities and magazine writers visit them to seek ‘Tosa Jiro’ per a year. But celebrity is not Komatsu’s main focus. It’s all about chicken.